Still an inspiration – I do enjoy your blog! Will have to try the special dark cocoa. I do love the SD chips. 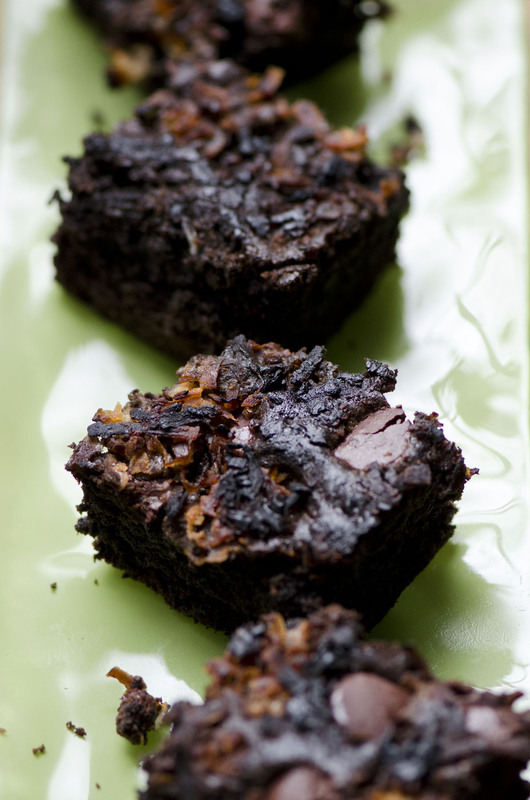 Thanks for visiting – I like the Special Dark Cocoa Powder – as you can see the brownies were – forget about the burnt part – much darker and richer than usual – top that with dark chocolate chips and you get a blue ribbon! They were tasty – and I know you wouldn’t burn yours! In a pot over medium heat, whisk together almond milk and unsweetened cocoa powder. Stir in the stevia and coconut until completely combined and remove from heat. Spread coconut mixture out on a parchment or silicone mat lined baking sheet, and bake in the oven at 350F for 25-30 minutes, depending on how crunchy you like it. Stir the granola about 15-20 minutes after it has been in the oven. Check pretty frequently in the final minutes of baking to make sure it doesn’t burn. Let cool completely before storing in an airtight container. (It will last longer if kept in the fridge.) Remember, the granola will harden a little bit as it cools, but not too much. Scoop dough out by the tablespoonful onto prepared baking sheets. Bake for 10 to 13 minutes until toasted brown on top. Remove from the oven. Allow to cool for 5 minutes before removing to a wire rack to cool completely.